In most cases, using the built-in deployer and export templates is good enough. Compiling the Android APK manually is mostly useful for custom builds or custom packages for the deployer. Also, you still need to follow the steps mentioned in the Exporting for Android tutorial before attempting to build a custom export template. Set the environment variable ANDROID_NDK_ROOT to point to the Android NDK. You also might need to set the variable ANDROID_NDK_HOME to the same path, especially if you are using custom Android modules, since some Gradle plugins rely on the NDK and use this variable to determine its location. To set those environment variables on Windows, press Windows + R, type “control system”, then click on Advanced system settings in the left pane, then click on Environment variables on the window that appears. To set those environment variables on Linux or macOS, use export ANDROID_HOME=/path/to/android-sdk and export ANDROID_NDK_ROOT=/path/to/android-ndk where /path/to/android-sdk and /path/to/android-ndk point to the root of the SDK and NDK directories. 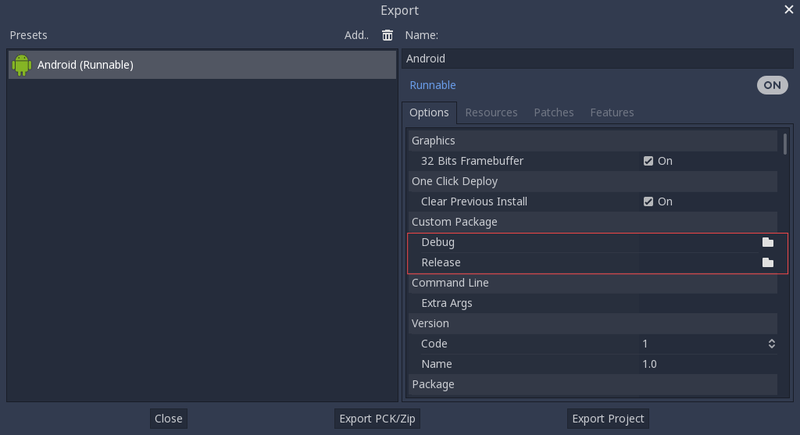 Godot needs two export templates for Android: the optimized “release” template (android_release.apk) and the debug template (android_debug.apk). As Google will require all APKs to include ARMv8 (64-bit) libraries starting from August 2019, the commands below will build an APK containing both ARMv7 and ARMv8 libraries. The resulting APK will be located at bin/android_release.apk. The resulting APK will be located at bin/android_debug.apk. This will create a fat binary that works on all platforms. The final APK size of exported projects will depend on the platforms you choose to support when exporting; in other words, unused platforms will be removed from the APK. Godot needs release and debug APKs that were compiled against the same version/commit as the editor. If you are using official binaries for the editor, make sure to install the matching export templates, or build your own from the same version. When exporting your game, Godot opens the APK, changes a few things inside and adds your files. <version> is of the form major.minor[.patch].status using values from version.py in your Godot source repository (e.g. 3.0.5.stable or 3.1.dev). You also need to write this same version string to a version.txt file located next to your export templates. You don’t even need to copy them, you can just reference the resulting file in the bin\ directory of your Godot source folder, so that the next time you build you will automatically have the custom templates referenced. Check that the debug keystore is properly generated. Check that the jarsigner executable is from JDK 8. Then check the output while the application is installed; the error message should be presented there. Seek assistance if you can’t figure it out. Make sure to use export templates that match your editor version; if you use a new Godot version, you have to update the templates too. libgodot_android.so is not in libs/<android_arch>/ where <android_arch> is the device’s architecture. The device’s architecture does not match the exported one(s). Make sure your templates were built for that device’s architecture, and that the export settings included support for that architecture. In any case, adb logcat should also show the cause of the error.